[Updated] A vehicle was found crashed into a side railing on Wellington Street in St George’s today [Apr 19], and at this time details surrounding the collision are unclear. 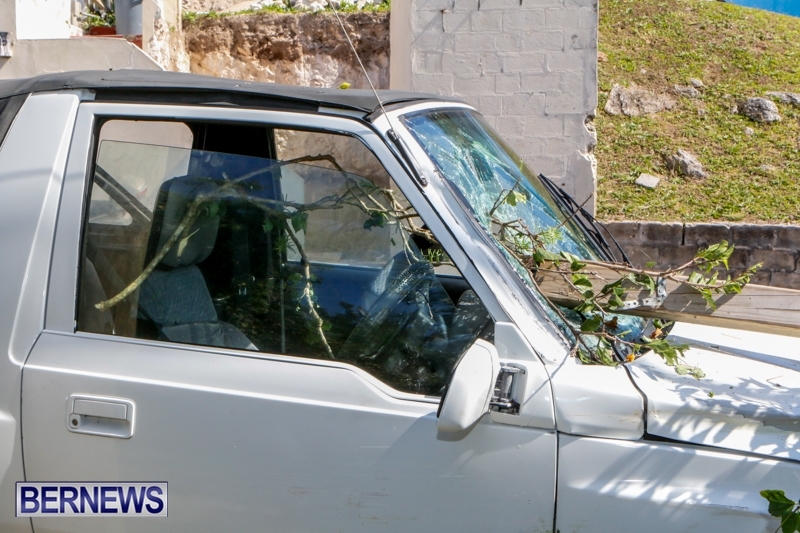 The railing penetrated the front windscreen, and there is also some foliage inside of the vehicle. We came across the collision scene earlier today, and at last check the vehicle is still there. We have no further details at this time, or any information about any possible injuries, however will update as able. Update April 24: A police spokesperson said, “Around 5am on Saturday, April 19th police officers attended a reported single vehicle collision on Wellington Street in St. George’s in the vicinity of Penno’s Wharf. “It appears that a car was being driven along Wellington Street when it collided with a wooden railing. 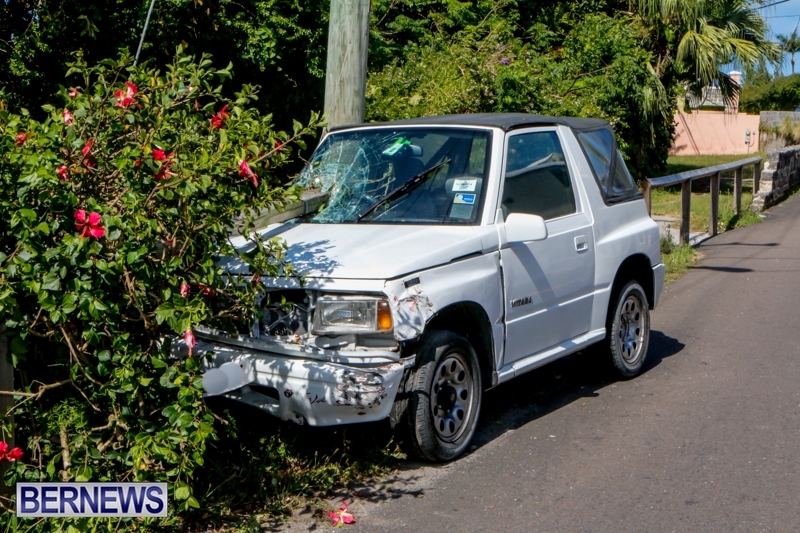 Apparently there were no reported injuries; however the vehicle was damaged. This person is lucky he/she wasn’t skewered with the car. Crashed? Parked just where I left it! I guess they’re waiting till Sunday to see if it rises from the dead. Perhaps Works and Engineering should revise the design of their wooden fencing. I have always thought they would do exactly occurred here. Skewering the car is a good description! A few inches to the left and the driver would have been skewered. Perhaps people should stay between the middle of the road and the side of the road rather than using the rails as bumpers. Accidents are accidents, re engineering the entire road system would cost money we really don’t have. @Goodidea Baddidea Have you ever had an accident. Many of us have and I hope your mother, father, son, daughter don’t become a victim of this. You/ They can be crossed off the road, hit and driven into the railing, swerve to avoid a child or animal that runs out in the road. This is a horrible design that can be fixed easily to avoid decapitation and cost very little. I often wonder who at W&E comes up with these ideas. 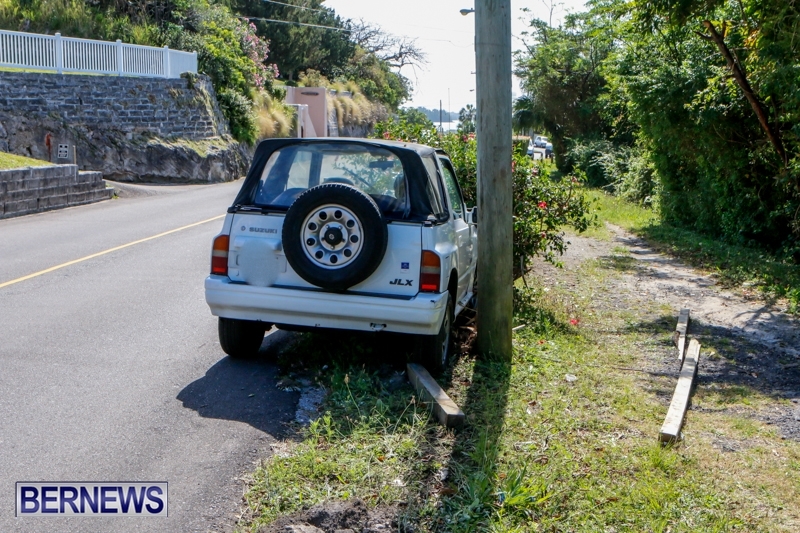 There are a ton of dangerous railings like this around the island, unfinished projects, not to mentioned these stupid speed bumps on the main road. 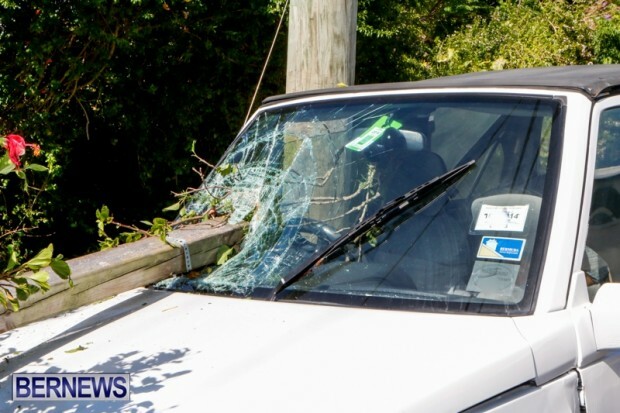 I know a 62 year old woman that is suffering from head and neck pain after she drove over a speedbump on the corner before Knapton Hill and hit her head while driving one Evening. I saw a young girl wipe out in Flatts after hitting one of these surprise bumps. I know of another individual that was rear ended after he had to slow down for the speed bumps on Berkeley Hill. Three people injured and two vehicles damaged because of something that is supposed to make our streets safer. All of these speed bumps should be painted a distinctive color with reflective paint.. or at the very least have warning signs painted on the road before you approach them. I’d be hard put to come up with a design that when hit with a vehicle couldn’t cause some sort of danger to life and/or limb. And while I am not a fan of speed bumps, perhaps is people drove the speed limit and paid proper attention to the roads, these speed bumps wouldn’t be a surprise or cause someone to hit their head on the roof. As to the person who was rear-ended, the speed bump wasn’t the cause, the person behind them tailgating or not paying attention was. As for painting them in warning, shall we do the same for long standing pot holes? Someone should tell that driver, we drive on the other ‘left’ over here. The money to fix it is there. When you drive by a W&E crew that is just hanging around or cooling out in their trailer – they are still getting paid! Those that don’t work or do half ask work – fire them, use that 50-60K to fix stuff. It a good thing James doesn’t think to often…. I agree ! The Design of these wooden rails me to be reviewed for driver safety ! Not the first time I e seen or heard of them doing this to a vehicle !! Anyone see Wolf of Wall St…This is similar. I am sure the driver hadn’t a drop of alcohol in their system. LOL… and thought he got home completely unscathed. And you need a vehicle livin St.Georges, what goods a passport to Hamilton if you have to catch a bus to utilise it? Sorry but Bermudians have to be some of the worse drivers after dark. 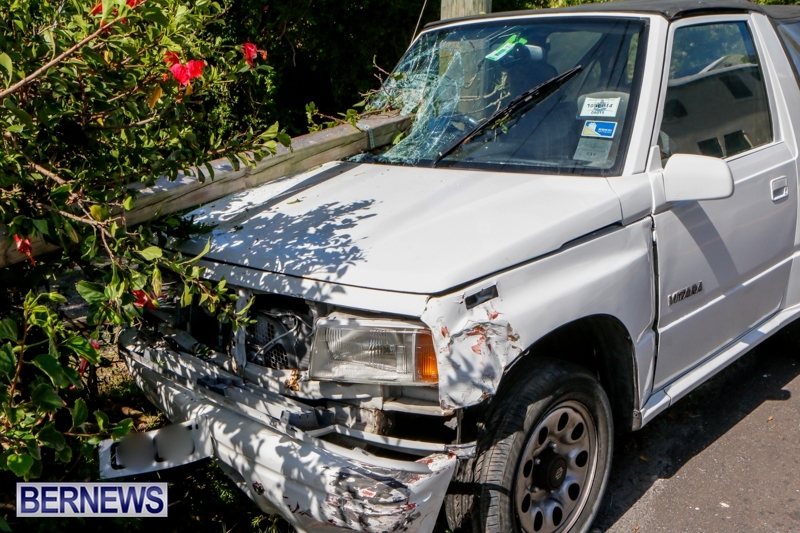 When you drive to work Monday mornings, have a look at the damage that occurred over the weekend. Every weekend! I am no angel, but……. I agree, every Monday there is a wall, railing or hedget that was taken out along the North Shore over the weekend. The thing that irks me is that they are never repaired by those that damage them! Why are these individuals, or their insurance companies not forced to pay for damage done to public property!!!!!!!! !